Marbella’s latest fashionable eatery ‘Zest’ opened its doors to much fanfare this month. The trendy café/restaurant can be found in Nueva Andalucía’s Centro Plaza overlooking the iconic La Concha Mountain, and has already proved a hit with locals and famous faces alike. Formerly known as Starz Café, this new café/restaurant combination is an upmarket hotspot that puts great food and a seductive ambience at the heart of its business. Run by husband and wife team Leif and Lily, the pair are joined by two top young chefs who claim, “miracles are performed on a daily basis in the kitchen”- and they’re not far off. The mouth-watering breakfast menu offers everything from an English breakfast and blueberry pancakes to fresh fruit salads and home made granola. The lunch menu offers such classics as honey and soy glazed baby back ribs, crispy duck with watercress salad and home-marinated salt beef and new potato salad. 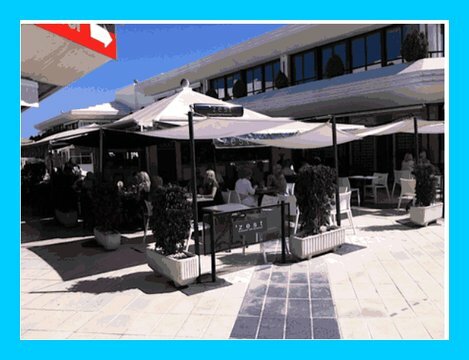 Ideal for a light lunch or late breakfast with friends, Zest offers exquisite food in a classic Marbella setting that nonetheless maintains reasonable prices in a popular location. However, it’s the legendary cocktails that are really drawing in the crowds after work, especially for the 5-7pm Happy Hour. During this time cocktail connoisseurs can escape the hustle and bustle of Puerto Banús and unwind with a multitude of mixtures overlooking one of the best views in Marbella. To whet your appetite a little you’ll find Mojitos, Cosmopolitans, Cranberry Cream Mocktails and dozens more on the menu. However, if a softer drink is more your cup of tea, you could always sip an Italian Gusto coffee before heading to the Saturday morning market just opposite Zest. So if you haven’t already visited Zest come down this weekend to see why everyone is talking about us.